Tonight I’m cooking roast chicken for dinner. The raw bird I bought earlier in Metro says ‘Roast Chicken’ in English on the packaging which means that it comes without its head, neck and feet, in other words, specially prepared for westerners who can’t face the full animal. After 18 months of surviving with only the two fiercesome gas rings on our hob, we gave in and bought a table top electric oven, (Red Tomato brand) so that we could occasionally indulge in those foods we miss, roast meats among them. Last weekend I prepared another western style meal for the dozen or so friends who came round to celebrate my graduation. The main event was steamed salmon and I was amused to watch the reaction of the Chinese people who were among the guests. They ate a small piece politely, but I could tell they didn’t think much of it. I asked my Chinese teacher a couple of days later what she thought of it. It’s expensive, she remarked, and we find it a bit ‘dan’淡. The word she used translates as weak, insipid or bland. Another problem is that the lack of bones which makes salmon so appealing to the western palate is exactly why Chinese people find it so boring. It lacks ‘mouthfeel’ (i.e. bones and crunchiness). Still, she said, encouragingly, it’s always good to try out different foods. (She had only just survived the shock of tasting gorgonzola, a bit of an ask for someone who has never eaten cheese before I suppose). I think another problem was that as my teacher comes to our flat three times a week she had observed the preparations for the party and was secretly horrified that the salmon was cooked a day in advance. Freshness is all in Chinese cuisine and everything is cooked pretty much just before it is eaten. We have been invited to my Chinese teacher’s wedding next weekend and I will be very interested to see what we are given to eat. We are only attending the first lunch party at the bride’s family’s village, about 90 minutes away in the mountains outside Ningbo. The meal will be in the ancestral hall and we have been warned to wear warm clothing as there will be no heating. On the other hand my friend from the Faroe Islands was very pleased with the party menu as the salmon came from her native land. I know this because as a cash and carry Metro sells whole salmon which lie on their bed of ice with a ticket through their gills which proclaims their origin. Apparently, the export of Faroe Islands salmon has much increased since the Chinese fell out with the Norwegians over the awarding of the Nobel prize to a Chinese dissident. Straight after my graduation ceremony, and the ritual of the group photograph outside in the sunshine, complete with throwing our mortarboards into the air, we went to have lunch in the student canteen on campus. Our friend, another Dean, joined us. Although also a secondee from Nottingham, he is a fluent Chinese speaker and his job is to read out the names at the ceremony, something from which Fintan is exempt. My name didn’t cause him much trouble, he told us. Although every Chinese student has an English name which they use every day at UNNC, come graduation their parents want to hear their child’s Chinese name. This means the person reading them out must practise hundreds of different names, each with three characters. Each character could have one of four tones. I have to admit that this was the first time I’d ever ventured into a student canteen (there are three). The serried ranks of electric steamers which sterilised the chopsticks especially intrigued me. Any time I’d wanted a snack or coffee over the last two years I’d always gone to Aroma, the café set up in the basement of the main admin building for westerners (staff and students) desperate for a cappuccino and a sandwich. The food on offer in the canteen was apparently better than usual, the more to impress visiting parents, and a huge buffet was on offer. Lots of mouthfeel, especially from the different kinds of fish, but my chopstick skills still haven’t improved sufficiently for me to relish filleting a small flat fish and managing to get most of the flesh into my mouth without embarrassment. I much prefer salmon. 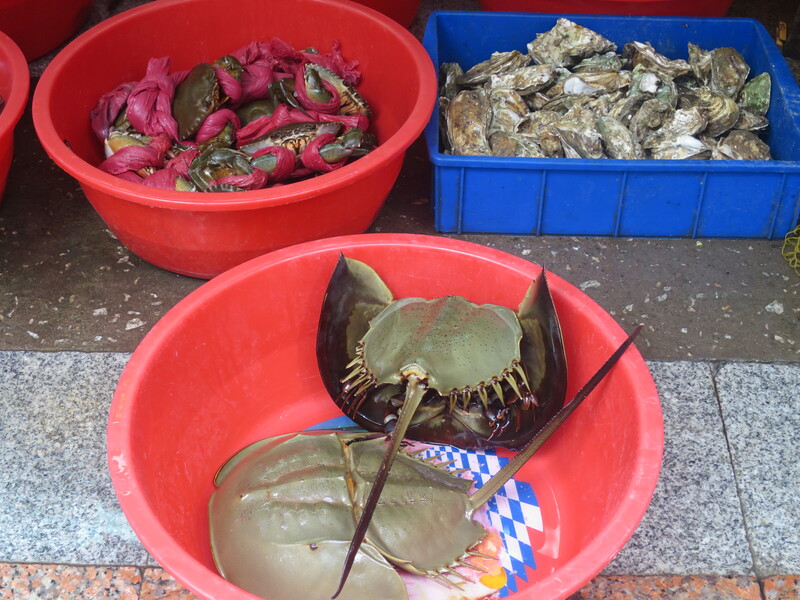 Seafood at Xiamen. What are these creatures? Trilobites? Last weekend we travelled to Xiamen, in south China, quite near to Hong Kong. Xiamen used to be known as Amoy and, like Ningbo, was one of the first five ports opened up to the ‘foreign devils’ in the mid- 19th century. We stayed on a small island called Gulangyu, opposite the main city centre, famed for its mild climate, flowers and beaches. Our instructions, received from the hotel, were to ask the taxi driver at the airport to take us to ‘lun du ma tou’ which translates as ‘steam ferry’. All went well and despite nearly falling asleep at the wheel, the driver dropped us off at what looked to us like the main ferry pier. We jumped on a boat and in ten minutes were across on Gulangyu. There are no cars or bicycles on the island and the reduced noise level is blissful. The environment also differs from the norm in China in that many of the dwellings are over a hundred years old and built in the style of European villas with fabulous gardens. Many of these are now hotels, in one of which we stayed. When we arrived, late in the evening with the crowds gone, it felt like being in southern Europe, only with more lush tropical vegetation. However, by about 9.30am we were quickly reminded that this was indeed China. Boatloads of young Chinese arrived in holiday mode, mainly to gobble down platefuls of seafood – roast oysters, crabs, razor clams, sea cucumbers, clams, octopus, squid and so on. Small restaurants have bowlfuls of live shellfish outside and punters choose their favourites, which are then weighed and a price agreed before cooking. As you walk down the main street of restaurants, your senses are assailed by the smell of fried and roasted fish, especially whole squid-on-a-stick. Next day was spent wandering around the small streets and alleyways of the island, visiting various scenic spots, including the piano museum, and watching couples having their wedding photos taken, perched on rocks. To our surprise, in the centre of the island we came across a playing field on which rugby matches were taking place. This weekend was the ‘All China Women’s Rugby Tournament’. The event didn’t seem to detract the Chinese visitors from their pursuit of seafood, but we enjoyed sitting under palm trees for half an hour watching teams of young ex-pat women playing rugby while their Australian male coaches (dressed in drag) shouted at them from the side-lines. On Sunday we decided we should explore Xiamen proper, across the water, and this was when our troubles began. We had assumed that the ferry would take us back to the same ‘ma tou’ as on Friday night. After 15 minutes we quickly realised we were heading somewhere else, which turned out to be a huge new ferry port, half a mile up the coast, built to cater for the ever-growing number of tourists. I attempted to ask at the ‘Information Desk’ where we were and how we might get to Xiamen Museum. No English was spoken and my Chinese was not up to the task, although a friendly woman taxi driver (fully awake this time) managed to find the museum which was part of a huge new ‘Arts and Culture Centre’ – so new that the Information man at the ferry port didn’t know about it. This is a common occurrence in Chinese cities where buildings and suburbs spring up so quickly that it takes time for people to know they are there. On our return, more problems occurred. We made our way to the old ferry pier, to discover that this only operated at night and in the early morning – hence our confusion. After a bus journey to the new ferry port we discovered that there was no space on ferries going to Gulangyu for another two hours. We filled in the time by drinking tea and eating custard tarts in the seafood restaurant upstairs, which was so big that it covered the entire footprint of the ferry port. Finally we boarded a crowded ferry. Our troubles didn’t end completely at this point, as once again the unexpected happened, and the ferry landed at a different port on the island. Luckily, Gulangyu is small and we found our way back easily enough. We took no chances the next day when we were leaving for the airport, and at 6.30am a man from the hotel took us down to the quay to board a ferry which to our relief went back to the old port. My confidence in my linguistic ability has been somewhat dented, despite my successful interactions with the tailor in Ningbo. I have been reminded that we remain pretty much illiterate here. We simply don’t spot or can’t read vital instructions, and therefore make frustrating and exhausting mistakes. As usual, we had an interesting and stimulating trip, but it will take us a few weeks to get up the energy to plan another one.